New spec SM shocks coming for 2019 – get yours starting in November! Just an early heads-up for our many Spec Miata clients: Mazda and Penske have developed a spec damper, approved by both SCCA and NASA, to be phased in next year. (No, you can’t get a set in time for Runoffs – sorry!) The shocks will be available only through Mazda Motorsports, and will cost about a grand for a full set. You can learn more here. Naturally, we will be among the first to get our hands on these new pieces, test them, and see how they affect overall handling. Call or email to talk about it! Lots to cover, as usual. So let’s hit the throttle! The cool photo is of our buddy and former client Max Tullman, who recently made his NASCAR Xfinity Series debut at Iowa Speedway. We are bursting with pride, because another alumnus, Dylan Murcott, will start his first Xfinity race August 11 at Mid-Ohio. NASCAR is a regular Flatout Motorsports reunion tour these days! Max and Dylan were both insanely fast the moment they climbed in our Miatas, and we’re not the least surprised by their bigtime success. 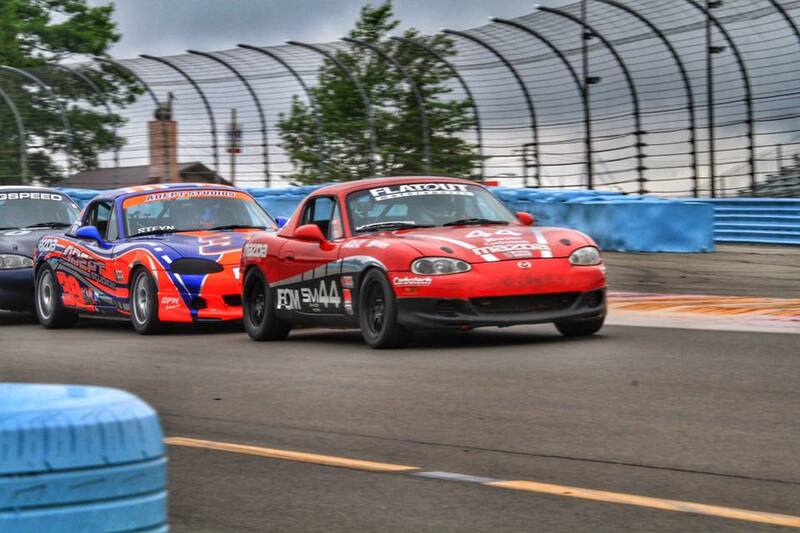 Speaking of Mid-Ohio, the Global MX-5 Cup series held there in late July featured a trio of Flatout cars. Jesse Schmidt and Charlie Belluardo were joined by the boss, Nick Leverone, making his Cup debut. All the guys showed good pace, but typical midpack shenanigans prevented them from seeing the results they would have chosen. Before you know it we’ll be in Portland, Oregon, where Jesse and Charlie will have a go at Rounds 9 and 10 of the series. Finally, here’s a nice writeup of some tight Hoosier Super Tour points battles heading into the SCCA Runoffs at Sonoma Raceway. Flatout friend Danny Steyn is in the thick of two classes (SM and STL). Tyler Kicera is ready to pounce in SM. Leverone and Amy Mills are going toe to toe with Steyn in STL. There’s a whole bunch of California dreamin’ (of podiums, that is) going on! Did you know we work on street cars too? 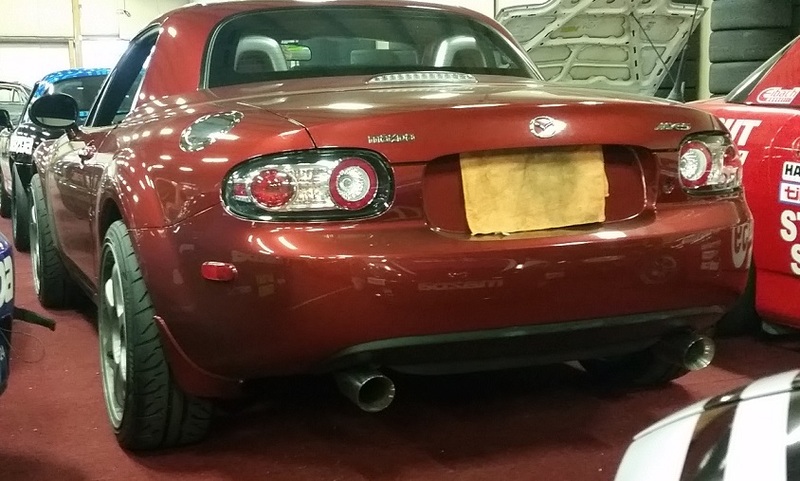 This roadgoing NC Miata is gorgeous, we’re sure you’ll agree – but man, it’s too tall! Looks like it’s ready for rock-crawling duty. Never fear, though: The car’s in for an altitude adjustment in the form of a coil-over kit. Flatout Motorsports has a quarter-century racing heritage, so not everybody realizes we’ve been modifying and tuning street cars since our earliest days. Lots of folks bring us their dailies and track toys for suspension work, brakes, rollbars, high-performance seats, chips, exhausts, turbo installs, and general maintenance. And while Miatas are certainly our bread and butter, we’re not a Mazda-only shop by any means. Hondas, Porsches, BMWs, Corvettes, Mustangs – any marque, any nation of origin, we’ll work on it and do the job right. Contact us to set up an appointment! Leverone, Bergstein and Mills working the draft. Wow, there’s tight racing on the track and in the points! The weekend of June 22-24 found us at Watkins Glen for the final pre-Runoffs Hoosier Super Tour. 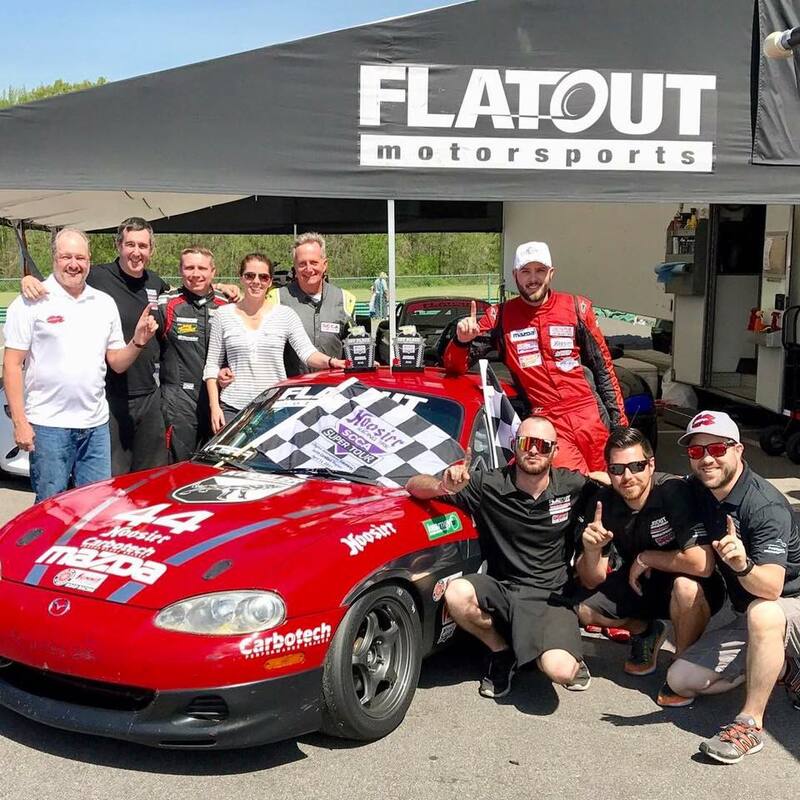 The Glen is one of our favorite tracks, so it was no surprise that the Flatout Compound was jammed: Company president Nick Leverone raced, as did Tyler Kicera, Hugh McHaffie, Craig McHaffie, Amy Mills, Whitfield Gregg, and Lance Bergstein. Crewmen Adam Desrosiers and Cory Bentley did their usual sterling job, with a boost from old friend (and part of the original Flatout gang) Forrest Stevens – so good to see Gump at the track! The event included the usual ration of weather drama and tight racing that make the Glen so special. Everyone ran well, with highlights including SM wins by Tyler (check out the video of Saturday’s insane final lap! ), STL checkers for Leverone, and a podium for Craig McHaffie. For a terrific writeup of the weekend with full results, see this Racer Magazine piece. With the 2018 Super Tours in the books (again, pending the SCCA Runoffs), a single point separates our buddy Danny Steyn from Nick in STL, with Mills in third. It doesn’t get any tighter! Summer rolls along – Cup testing, Road America! With our next Global MX-5 Cup race coming up in July, FOM hotshoes Jesse Schmidt and Matt Koskinen (71) recently squeezed in a full day of testing at Palmer Motorsports Park (we hasten to add that this particular pic was shot previously at Barber Motorsports Park). The guys reported that the cars were on rails, and the lap times proved it! A promising sign for that late July date at Mid-Ohio. Summer is here – full speed ahead! Memorial Day Weekend found Team Flatout at one of our favorite venues: New Hampshire Motor Speedway, where many FOM drivers got their start and we have thousands of collective laps under our belts. 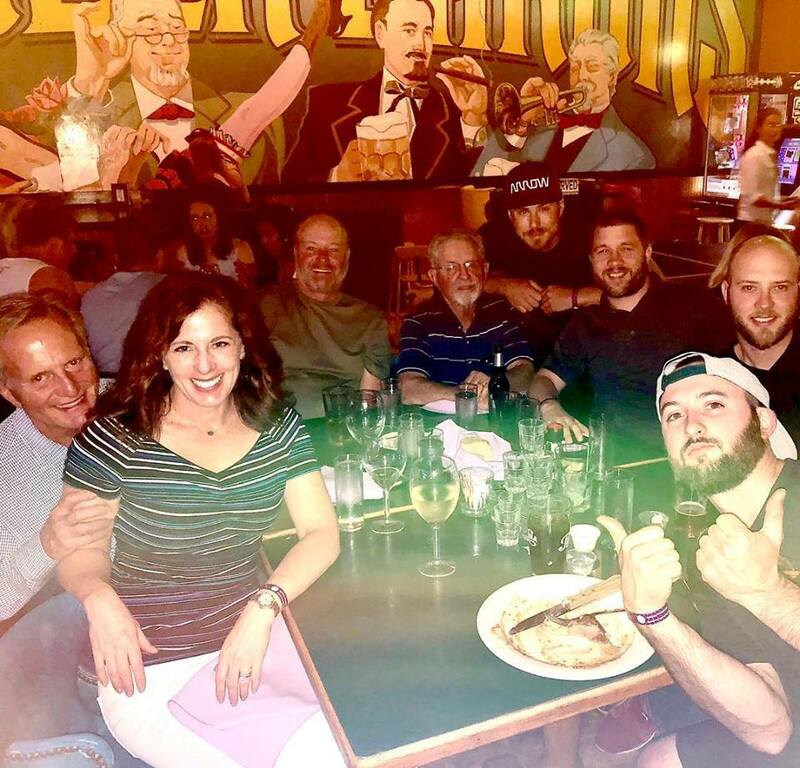 So we couldn’t help but reminisce a bit, especially when it turned out all four of us old-timers showed up to crew or just hang out. Right to left, that’s Nick Leverone, Andy Bettencourt, Adam Desrosiers, and Steve Ulfelder. Mount Rushmore we ain’t, but it sure was good to see everybody! With the late-May weekend ushering in summer, it was also useful to glance at the calendar to see just how busy we’ll be over the next several months. We’ll be renting cars and crewing Arrive & Drives at SCCA Regional weekends, test days, Global MX-5 Cup extravaganzas, Hoosier Super Tours, and more! Few tracks will be safe, as the Flatout caravan will hit Mid-Ohio, Lime Rock, NJMP, the Glen, Road America … you name it. To get in on the action, check out the schedule and call us about seats! Wherever, whatever – we’ve got you covered! We were looking over our most recent forays to various tracks, as well as our upcoming schedule and some of our alums’ accomplishments, and it prompted this thought: Whether you’re just starting out or looking to become a professional sports car racer, Flatout has you covered! 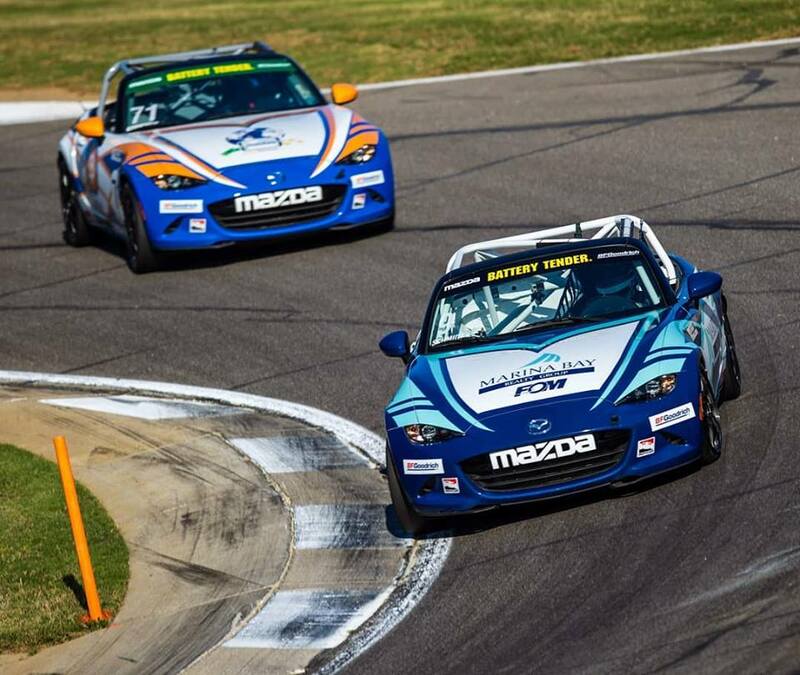 In less than a month, we prepped, transported, and crewed for a pair of bigtime Mazda Global MX-5 Cup races. We hit SCCA Regional, Double Major, and Hoosier Super Tours up and down the east coast. 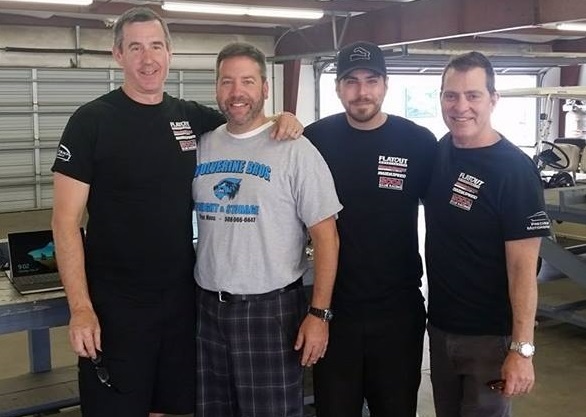 And this past weekend, we were at Thompson Speedway Motorsports Park, doing one of our favorite things: Helping new racers earn their SCCA Competition Licenses. Before you know it, we’ll haul 3,000 miles west for events in Portland, Oregon. Meanwhile, the phone’s ringing and the in-box filling with dyno, tuning, and rental requests. And current and former clients are cleaning up in global Lamborghini series, NASCAR, and Pirelli World Challenge. Bottom line? Contact us! We’re here to help enthusiasts and racers of all experience levels. So you want to run up front in Spec Miata, eh? Study up. This is Virginia International Raceway, April 15, 2018. It’s terrific in-car footage, and not just because hotshoe Tyler Kicera passes a bunch of the nation’s top amateur racers on his way to the checkers. What we love is Tyler’s helmet cam, which lets you know exactly what the driver sees. Enjoy! The more the merrier! 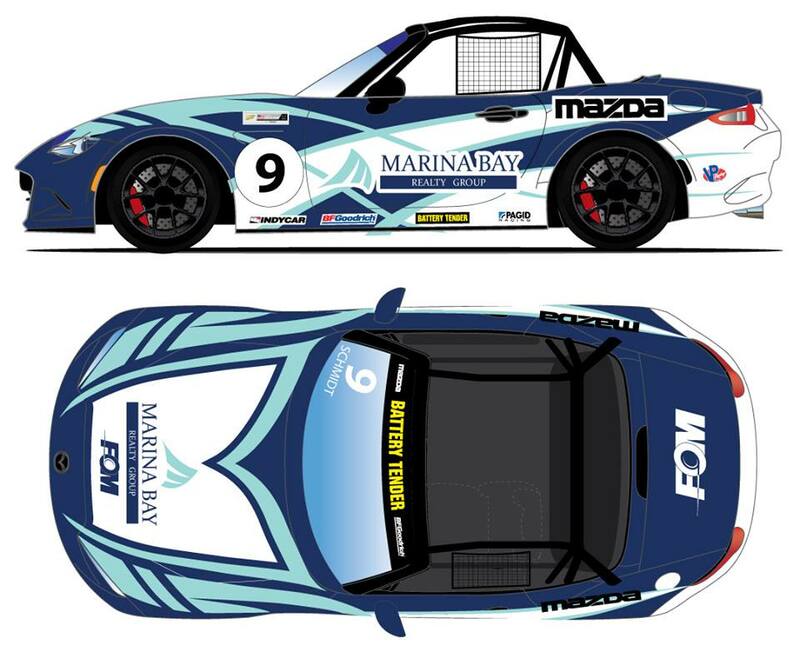 The cool livery you see here belongs to accomplished hotshoe Jesse Schmidt, who will join Matt Koskinen and Charlie Belluardo in the April 19-21 Global MX-5 Cup race at Barber Motorsports Park. While Matt and Charlie raced last month at COTA, this will be Jesse’s series debut. We welcome him to the Flatout Motorsports team – it’s an honor to support such a trio of talented racers! To learn more about the series, and for livestream info, check out Mazda’s terrific Global MX-5 Cup site. And be sure to root for our guys! Ready to come back north for more racing! And that, in turn, reminded us that the following weekend, we’ll be back on our New England stomping grounds at Connecticut’s Thompson Speedway. We’re back to Summit the following weekend, but here’s the point: Racing season is finally hitting the northeast! Palmer, Pittsburgh, NHMS, Lime Rock, the Glen … you name it, we’ve got events there. So if you thought the snow would never end, be advised the time has come: Check out our schedule, contact us, and get your 2018 rental or Arrive & Drive booked!